In my research of all things Fianna, I have come across numerous references to the mysterious war-cry of the Fenian war band as the ‘Dord Fiann’. Don’t get me wrong; undoubtedly the Fianna did have their own unique battle chant as they charged into the fight. But a Dord is an ancient Irish war horn, very similar to the Celtic carnyx. It looked like a huge S-shaped trumpet which the player held to his lips, and it loomed over the heads of the ranks of the army like a giant up-raised elephant’s trunk. I’m sure its ghostly, wailing cry would have stirred the blood of the Fenians, and struck terror into the hearts of their enemies. But more than that, it also had a practical use. In the tumult of battle, it would have been difficult to communicate with large ranks of war-frenzied men and direct them. Different sounds and notes blown on the Dord were used to issue commands, ie go forward, retreat and regroup, mount up, etc. and would have been instantly recognisable to the Fianna. To see images of how the Dord may have looked, and hear how it may have sounded and been used in battle, click this link. Now for the science bit; The Dord dates back to approximately 1000BC, in bronze age Ireland. It is very similar to the Celtic Carnyx, the name deriving from the Gaulish word ‘carn’ or ‘cern’, meaning ‘antler’, or ‘horn’. 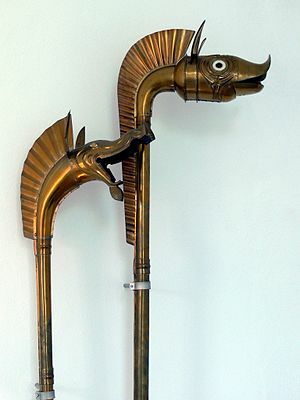 it was typically about 6ft in length, and made of bronze, with no mouthpiece as such, just a rim, and the bell being made in the image of some fierce wild animal, such as a boar. It has a range of about 5 octaves, which is much greater than most current brass instruments. The Dord Fiann itself is called the ‘Borabu’, and was said to have been found under a stone by Fionn mac Cumhall’s son, Oisin. It is said that only three blasts of the Borabu will wake Fionn from his sleep under the green hills of Ireland. ← I just love researching for my books! Well, I wasn’t getting far with descriptions of the borabu, because I have very limited experience with wind instruments of any kind. It’s almost impossible for me to get pictures of things I have no reference for at all. The youtube video with the sounds was quite helpful in getting around that! Ailbhe had a few things to say about the video: they could have played the horn much louder, screamed more, and not bothered with that many horses. Also she says it is redundant to shout orders and sound the horn consecutively, and it’s not strategically advisable either because your opponents will quickly learn which orders correspond to which sounds. I’m definitely impressed with the octave range. I’m also really glad to have personally never been in a battle, incidentally. I could tell the scene brought back fond memories for Ailbhe though, even though it was so long ago. Those horns look Egyptian. I wonder what it would have been like to stand on that battlefield, hearing the horns blast in a coordinated battle. Funny you should say that about the horns looking Egyptian…my husband believes that he ancient Egyptians did come to Ireland. I have read that Queen Tailltiu, who was married to the Fir Bolg High King Eochaidh, could have been Nefertiti. I don’t see why that wouldn’t be possible. Could even be the basis for a great story.